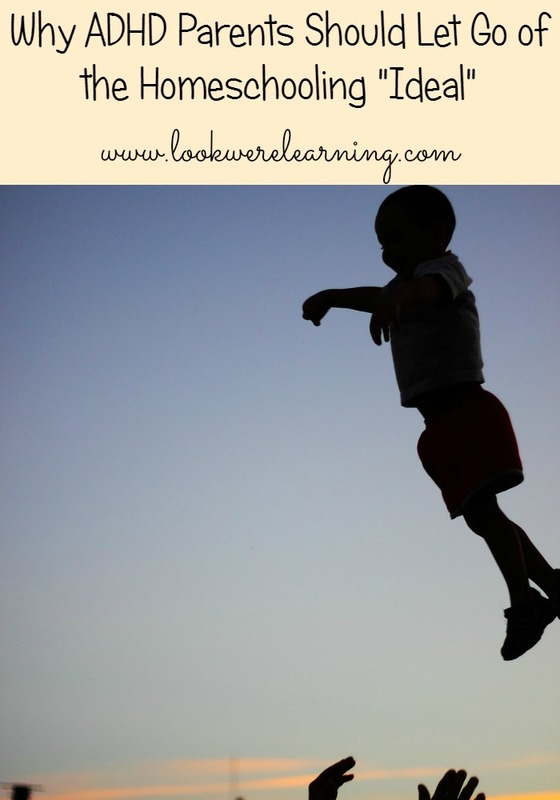 Why ADHD Parents Should Let Go of the Homeschooling Ideal - Look! We're Learning! When you first thought of “homeschooling“, what did you envision? I talked about my homeschooling dream a few months back when I shared my Homeschool Mom Confession at The Mommy Mess. In short, it was to have all of my kids sitting quietly at the dining room table – kind of like the one-room schoolhouse in Anne of Green Gables. Naturally, this is an unrealistic fantasy, so I wasn’t surprised that it didn’t come true. But while I dropped the more ridiculous aspects of my ideal homeschooling experience, I was still hoping for a certain homeschooling reality. I’d settle for completing an entire week’s lesson plan or finishing a picture book without my kids getting up or standing on their heads. Finding out that our kids have ADHD, though, threw a real monkey wrench in my plans for our homeschool. I tried lowering my expectations and reducing our schedule, but I still had a hard time dealing with our situation. I found out the hard way that, if our homeschooling experience was going to be a success, I’d have to let go of the homeschooling “ideal”. My first feeling after the diagnosis was sadness. I was sad that my kids were never going to be “normal”, because I felt that they should be able to sit down for an entire school lesson and they should be able to think before they speak. I worried that other parents would look at me as an example of what homeschooling should NOT look like. Then, there was the guilt that I felt after I realized that many of my primary parenting techniques were unfair to my kids. I had been unfair by expecting them to sit down and maintain focus during a lesson. I had been unfair by assuming that they were being disobedient when they forgot their assignments or got distracted on the way back to the table after a bathroom break. Those realizations were extremely hard to deal with. It wasn’t until I started reading about ADHD that I learned that there are positive aspects of having it. Our kids are extremely imaginative, which is a quality that can serve them extremely well both in school and in life. Plus, kids with ADHD tend to become super passionate about the topics that interest them, so the ability to focus is there if the subject is right. As an homeschooling parent to an ADHD child, it’s very easy to burn out and lose motivation to continue. The fastest way to burn out is to expect your kids to be like the ideal homeschooled kids. They may not graduate at 15. They may not read until they’re in elementary school. And they may not even potty train until they’re in PreK. But that’s just fine. As long as you help them love to learn and adjust to their needs, they’ll still be homeschooling success stories! This post is part of the month-long series “31 Days of ADHD Homeschooling“! Be sure to stop by tomorrow for Day 4: Understanding Your Child’s ADHD Brain! This is a great series and encouraged me to blog loosely on the positives I see in this. Truth is as an Engineer, Author, Mom, Business owner, homeschooling parent (yeah – I do all those things) back in the day I may have had such a diagnosis. However, do realize that because I used to get ‘distracted’ with thoughts or ideas that made it appear that I had no focus, I was focused. Intensly so on that one item at a time. Now I do a lot of things that many people couldn’t conceive of doing at the same time. But as an Engineer working with other ‘scatter brains’ I realized that having this is a gift. The ability to intensly focus on many different things for a little or as long as I want to – yet over time I learned the skill of doing them all relatively well. So much so that in all the areas above, I’ve considered to have success by most peer standards. The key is, before there were diagnosis, drugs to help kids with mild (not violent symtoms), those kids figured their way out. Just like anyone who would be deemed having some type of ‘handicap’, a person learns to live with the quirks that are ‘them’. So if you don’t use the term as a ‘bandaid’, ‘label’ definition of who your kids are – then they won’t. They will just know that they are wonderfully, and beautifully made. I really do appreciate this post and I’ll definitely be looking into the series. I have a soon with ADHD and a daughter with ADD and Dyslexia. I am very disappointed with their experience in public school; even though they both have an IEP. I’m looking forward to future posts. Hi, I just found your website and I love it! My autistic son has just been diagnosed with ADHD a and homeschooling him has proved to be something of a challenge! Your tips are great and I hope to be checking out more of your ideas and inspiration soon, as well as your Pinterest board. I try to limit the subjects that we do in a day when it comes to learning. I have found that doing different subjects in a day causes him to feel overwhelmed but if I choose one subject for the day then he grabs the bull by the horns and runs with it. Since February this year my son has completed English and spelling workbooks for grade one and two doing it this way. He is stumbling through subtraction using double digits in grade 1 math because he can’t be bothered but he knows the answer. We have started quite a few assignments but they are ongoing and not yet finished. The thing we struggle with the most is writing so any form of creative writing is out of the question when it comes to my 7yo boy. I do know he HAS learnt quite a bit by the fact that my 2yo daughter knows her colours, alphabet, numbers and shapes. I have not taught these to her as yet (I’ve been too focused on my son) but my son has. And this is what makes me not want to give up homeschooling. I do still need to let go of the idea that he will just do his work if I’m not standing over his shoulder or sitting next to him every minute of his learning time. If I don’t then he won’t do his work and we both tend to lose the plot quite quickly. My husband struggles and worries that he is falling behind but I think he is in front with a lot of things.